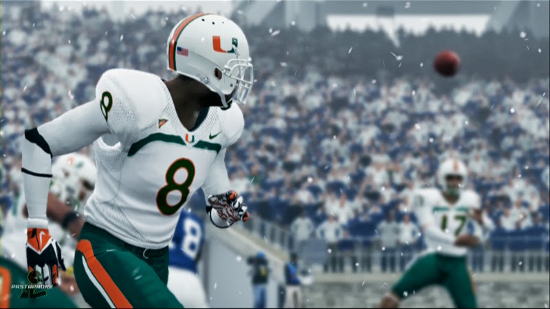 Shortly after release of NCAA Football 14 publisher EA Sports declared that the NCAA would be pulling their license (which only would have affected the name and official marks from appearing) and that the series would continue into the PS4 and Xbox One generation. That of course never materialized as the O’Bannon vs NCAA case had begun to scare away other partners as well, including conferences and individual schools which proved to be the tipping point. Less than two months from that initial assurance that the series was not going away NCAA Football was cancelled for good. Sadly four years later, and on the very day that NCAA Football 18 would have released, we’re not much closer to seeing it return. The ruling in the O’Bannon case actually provided hope that a system would be put into place that would allow for collegiate athletes to be paid for their likenesses. Judge Claudia Wilken’s original ruling stated that the NCAA violated antitrust laws and that athletes should receive compensation beyond just educational-related expenses. That amount would be capped at no less than $5,000 a year and would be put into a trust that would be received after completing eligibility. When the 9th Circuit Court of Appeals partially reversed Judge Wilken’s decision however, doing so meant there was still no way to compensate players. The case was then turned down for a hearing by the Supreme Court meaning the 9th’s reversal on the compensation aspect would stand. Athletes still have no way to collect pay for their likenesses in video games, merchandising, and so on. The necessary resolution that could have brought everyone but maybe the NCAA back on board was not achieved. While waiting for other lawsuits to potentially move through the court system that could change the landscape of college sports, the best gamers can look for is pro games that attempt to integrate college such as NBA 2K the last two years using them in the story mode. Any return of dedicated licensed college sports video games remains years off in the future.